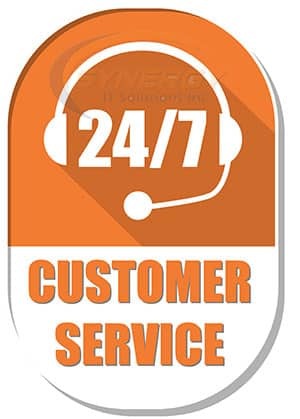 Are You Looking for IT Support 24/7? We are pleased to announce that effective year 2013, we now provide 24 x 7 IT support services to our customers in Toronto and all major cities covering North America. 24/7 technical support is now available. If you need any technical support for your system or network, we can assist you round the clock. We understand that considering the competitive scenarios, you need to operate 24 by 7 to be ahead of your competitors and we can support you 24 hours round the clock. Network Downtime after hours can be quite troublesome as not all IT companies support 24 by 7 operations resulting you the loss in thousands of dollars. An hour of network downtime could cost your company thousands of dollars. You need an IT Outsourcing Partner in Toronto who can you run your operations running 24×7 seamlessly. Synergy IT specialized IT support team makes this possible to ensure that your Information Technology Services are running at peak performance 24×7. Reliable: Call us anytime, we are there to help you 24/7. Can anyone do this? Contact us now to understand how can support you 24/7 in Toronto Area.